The day before I arrived in China in 2016, I was sitting next to my dad on the airplane. Being something of a basketball nut, he sought out the sports section of a Chinese newspaper available on the Cathay Pacific flight. This was a particularly good day to be a basketball fan as the Golden State Warriors had just won a record-breaking 73rd game (losing only 9), and the San Antonio Spurs also set a record for home wins in a season with 40 (losing only 1). But neither of these things were mentioned on the front page of the Chinese sports section as far as I could tell. Instead, it featured someone donning the number 24 on a yellow jersey, and I do not mean the leader of the Tour de France. Rather, it was someone who played on the second-worst team in the entire NBA this season. A Laker. Kobe Bryant. Kobe, you see, just played his last game in the NBA. Not only that, he scored 60 points. Sixty points! Never mind this was on 22/50 shooting and that attempting 50 shots and missing 28 of them definitely classifies one as a ball hog. The Chinese love Kobe Bryant. 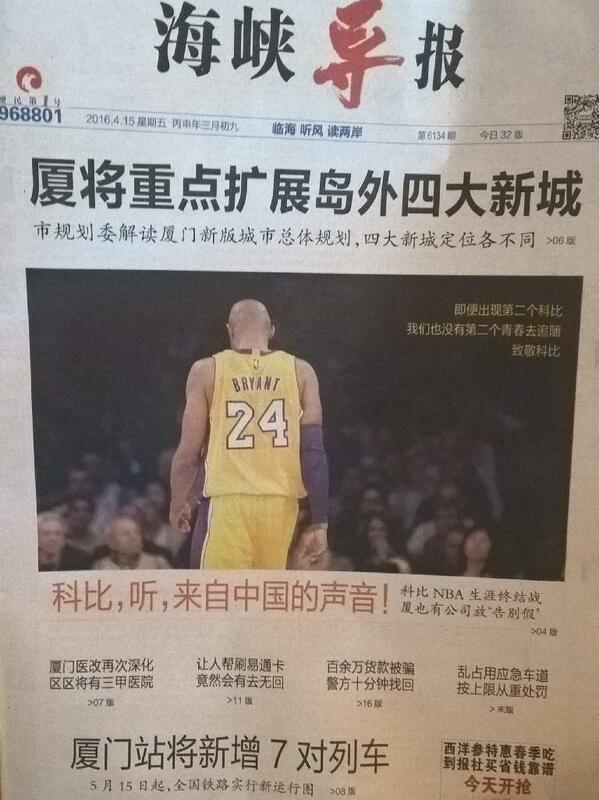 How much does China love Kobe Bryant? According to my well-read dad, Kobe Bryant jerseys have been the most popular NBA jerseys even while Yao Ming was still playing. My dad also said he wouldn’t be surprised if more Kobe memorabilia was sold in China than the USA. He may be onto something here. According to Bleacher Report, Bryant has been coming to China almost every summer for the last few years and he considers it his “home away from home.” Commercials and a reality TV show where he trains Chinese people in basketball are other reasons for his popularity. Incidentally, the Bleacher Report also wrote that this season, “Bryant shot 35.8 percent from the floor while jacking up 16.9 shots per game. The last player who was less accurate (with a minimum of 1,000 shots throughout an entire season) was Jim Pollard in 1952, per Basketball-Reference.” I mention this because Jim Pollard (a.k.a. the “Kangaroo Kid”) was a Stanford alumnus who, much later, was my 5th grade substitute P.E. teacher before passing away years later in my hometown of Stockton, California in 1993. And to again emphasize how the Black Mamba was a super ball hog to shoot even worse than Pollard. A much-loved ball hog, though. At least in the People’s Republic of China. The Chinese are going to miss him.